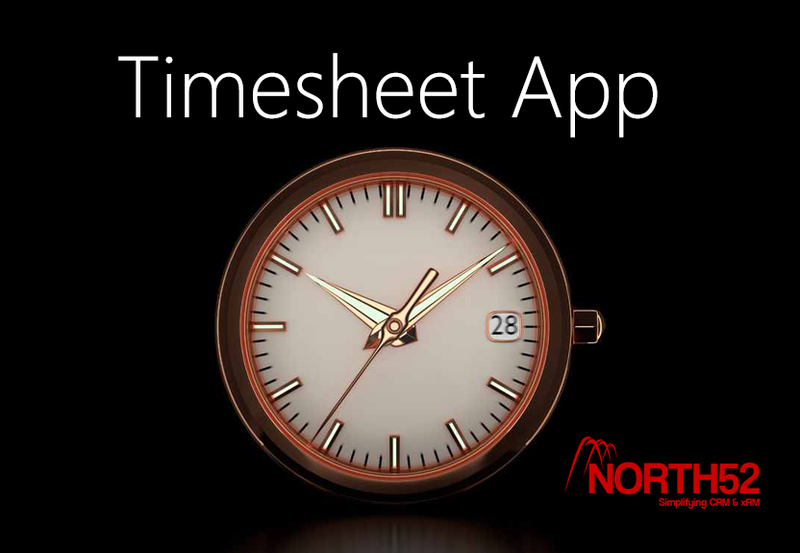 The Timesheet App from North52 is a ready-go-to solution for Microsoft CRM 2013+ that allows you to easily track time in CRM. It comes preconfigured with relationships to Cases and Opportunities but you can easily modify the solution to fit your needs. Simple buttons to Start, Pause and Stop your Timesheet records. Rules to ensure only one Timesheet record is in 'Timer' status. If a new record is created any record currently in 'Timer' status will be changed to 'Paused' to prevent any duplication of time. Notifications message depending on the status of the Timesheet record. Approval process with simple Approve and Reject buttons. Rules that only allow a User's line manager (as defined on the User record) or a User with the Timesheet Approver security role to Approve a Timesheet. Please contact us if you would like a trial license key to test the Timesheet App (at least a Professional Edition licence is required for continued use). Optionally customize the Timesheet entity to display it under the Sales, Service, Marketing and or Settings areas. Publish and refresh your browser page to reload the navigation. Assign the Timesheet User or Timesheet Manager and optionally the Timesheet Approver security roles to the relevant users. Ensure that users also have the North52 BPA - Standard security role too. You are ready to start recording time in CRM! Enter a Description for your Timesheet and Save. The Timesheet record will refresh and display a notification saying the timer is currently running and the Pause Timer and Stop Timer buttons are displayed. Go to another Case or Opportunity and add another Timesheet record. You will notice that your previous Timesheet record which had the 'Timer' status has now been paused. Wait another minute or two and click the Stop Timer button. The page will refresh and a notification will be displayed saying that the Timesheet record is awaiting approval. If you have the Timesheet Approver role you the Approve and Reject buttons will be displayed on the record. Optionally add some Approval Notes and click either the Approve button. The record will be made inactive with the Status Reason of Approved. The Approved By and Approval Datefields are set automatically. The solution includes a workflow to Bulk Approve Timesheet records. Validation logic will still apply. You can customise the Timesheet entity to add relationships to other records you may wish to record time against. Timesheet User - needed for users to enter and submit time. By default only have access to their own Timesheets. Timesheet Manager - allows a user to view and edit Timesheet records they don't own, however it doesn't allow approval unless the User is a Manager (as specified on the User record) of the Timesheet owner. Timesheet Approver - allows non-managers to Approve Timesheets. Needs to be used in conjunction with the Timesheet Manager role. 14 Formulas to enforce the business logic of the app. Most are commented to explain what the logic is doing where it may not be obvious.